The Hillary Fallacy – why the “Kang and Kodos” logic does not appeal to me. Home / Politics / The Hillary Fallacy – why the “Kang and Kodos” logic does not appeal to me. Despite my better judgement, I have recently found myself getting into social media exchanges with supporters of Hillary Clinton’s presidential bid. These exchanges are often acrimonious and always pointless, because no one ever manages to convince anyone else of their point of view on social media. However, the arguments propounded provide some interesting insights into where this campaign has taken us. 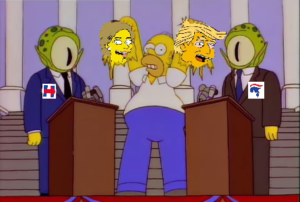 Back to the Social Media exchanges: I usually respond to the Kang and Kodos argument by explaining that although I think Trump is a thoroughly repugnant individual and an awful candidate, at least he won his party’s nomination through a fair and open process, and he did so against the wishes of the party elites. The same, I point out, cannot be said for Clinton; certainly not after the latest Wikileaks revelations. I then note that I believe the price America would pay (i.e. a Trump presidency) in order to punish the DNC for rigging the nomination would possibly be worth it, if the sting to the DNC was so great that it delivered real electoral reform for the next primary process. After all, what is at stake is something greater than 4 years of stupidity. It is the essence of democracy in the United States. This is of course perfectly true. Except when you combine the two arguments, “the DNC can rig all it likes and choose whomever it pleases” + “a vote which is not for the DNC’s chosen elitist is a vote for the other monster on the podium!” you essentially have an admission that the choice of president is in no way democratic. If the party nomination processes offer no real choice, then the two-party general election certainly doesn’t either. So if the Constitution does not provide guidance on the fair administration of primary contests, perhaps it is time for Constitutional reform. After all, the current system is so badly broken that even the most ardent supporters of the candidate whom bookies say is going to win in November (let’s call her “Kodos”) can only invoke the Kang and Kodos defence to convince us to vote for her. In the meantime, I will be using my vote in November to punish Debbie Wasserman Schulz and the DNC for what they have done to Bernie Sanders’ Political Revolution. I will be voting for Jill Stein, and I’ll be encouraging red state voters to choose Gary Johnson. Why is the world polarising? And what can we do about it?